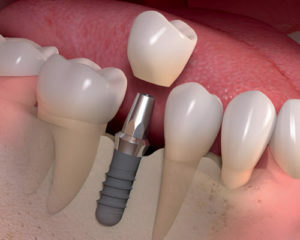 A Dental implant is an artificial tooth consisting of a root and a natural looking replacement tooth. The root is made of titanium, which is placed within the gum to form a secure foundation. the replacement tooth is made of porcelain, or a special plastic and is fitted on top of the titanium root. Sometimes the titanium root is used to anchor a denture firmly in place. Our implantoligist Dr Teoh has more than 10 years experience in implant dentistry placing over a thousand implants. Dr Teoh qualified from The London Dental Hospital in Whitechapel, University of London, in 1989. He received his postgraduate training in implant dentistry at The Turner Dental School in Manchester and obtained Master of Science in Dental Implantology 1994. Since then he has been actively involved in Implant Dentistry both in UK and overseas. He also obtained Master in Clinical Dentistry in Prosthodontics (A special branch of Dentistry that replaces missing teeth with prosthesis) from the Kings College, London in 2005. Dr. Teoh has more than 10 years of experience in implant dentistry. He also is a Member of the Association of Dental lmplantology (UK) and a Fellow of International Congress of Oral lmplantologists (USA).